BEER is for drinking, yes we know this. But beer is also an occasion for conversation—and, if good enough, a subject for it, too. That is where India Pale Ales, or IPAs, come into their own. Few beers incite and enrich conversation as much as IPAs. New Zealand breweries continue to amass a string of accolades, with IPAs seemingly becoming the country’s hottest brewing style. So where did IPA come from? The story of IPA is well-documented. It was shipped all over the world during the height of the British Empire to help quench the thirsts of the soldiers stationed in far-flung outposts. In the 1780s, Hodgson’s Bow Brewery, on the eastern edge of London, became the best-known and most popular brewer of pale ales for export to India, until the pale ales from Burton were viewed as superior in taste and quality. IPA is a child of Britain’s industrial revolution and the imperial expansion that rose to world-straddling greatness, IPA went on to be humbled by its upstart rival, the lager. It had all but vanished when supporters restored it to life and once more put the world at its feet. This is a beer with a back story. In 2015 Zeelandt Brewery began researching IPA’s with the idea in mind to create something truly unique, something with charm and character. A beer that would flit in and out each season, just like the 18th-century entrepreneurs who charmed their way around the world exchanging trinkets worth pennies for land worth billions. And just like our other beers, this IPA was created on the same premise reiterating our brewing philosophy – to produce beer from the new world inspired by the old world. After reading about an 18th-century recipe that used only a single barley and hop variety we secured classic English ingredients to create our very own Zeelandt IPA made from; Maris Otter (barley) and Golding (hops). Finders Keepers, is Zeelandt’s IPA, a seasonal beer with sass. Maris Otter is considered by some brewers as a superior barley in terms of flavour and extract. First commercially bred in 1965, it has a rich malt flavour and is considered an heirloom variety. Golding is known as a quintessentially British hop. It has a gentle aroma but deliciously smooth, sweet and earthy flavours that infiltrate the beer. Golding has been grown in England for over one hundred years. Finders Keepers is aged for 6 months on hops to help the oils really integrate into the beer. The beer is well attenuated so while at 7.5% Alc. vol. the finish is dry and refreshing. We fermented the beer with a yeast called Burton, an IPA Blend from Wyeast (1203PC). This particular yeast allows some fruity esters to come through by way of a warm fermentation. This English style of IPA has an interesting history and the making of this beer isn’t an attempt to replicate an old recipe verbatim but to try and express some old world flavours in a style made famous by the British Empire and reborn in the USA many years later. 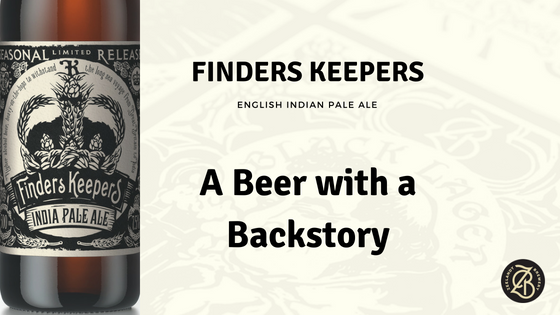 Finders Keepers is now bottled and is available to purchase. Shop online now.